Last week, rif, Shum and I went to Esquire Kitchen, 1 Utama for lunch. Esquire Kitchen specializes in Chinese Sze Chuan and Shanghainese cuisine, with 18 outlets throughout Klang Valley, Ipoh and Johor Bahru. 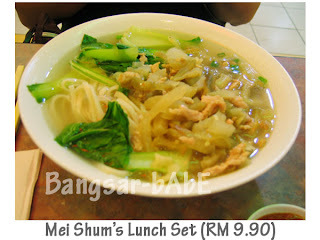 Shum had the lunch set – pork strip noodles with preserved vege. Her noodles set came with one lou po peng and 4 pieces of wo tip. rif and I went for the ala carte, as I had a 30% discount coupon to use up. We ordered the tong po meat, Szechuan stir-fried eggplant and a plate of wo tip (10 pieces). Tong Po Meat is one of their popular Shanghainese dishes which is best eaten with man tau buns, but we ate it with rice instead. This 3-layer pork meat is braised with dark soy sauce until it’s tender and melts in the mouth. However, if you can’t stand fat meat, you better not order this. 😛 The Szechuan stir-fried eggplant is also one of their specialties. 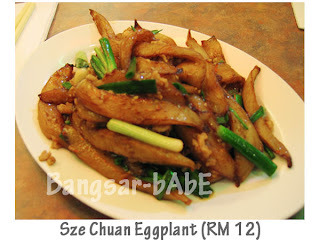 The eggplant is first deep-fried till tender before cooked with plenty of garlic, minced pork and spring onions. The only downside to this dish was the oil factor – very oily! 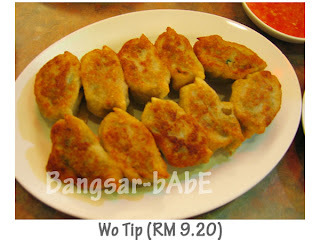 The Wo Tip or fried dumplings was delicious. I absolutely love these little pan fried delights and never fail to order them whenever I dine at Esquire Kitchen. The dumpling skin was crispy on the outside with juicy minced pork and chives on the inside. Lunch was quite satisfactory, especially with the 30% discount. rif and I paid RM 35.11 (After 30% discount) for our food, while Shum’s set cost RM 11.50 (discount not applicable) inclusive of 5% tax and 10% service charge. Verdict: Try their Wo Tip and Sze Chuan Eggplant. Their lunch sets are also pretty tasty and value for money.